Millions of Americans are experiencing temperatures so cold that a burst of wind could cause frostbite within minutes — conditions that have caused the suspension of regional train service, work and school schedules, and even production of television and stage shows. Commuters brave the wind and snow in frigid weather in Cincinnati, Ohio, Jan. 30, 2019. 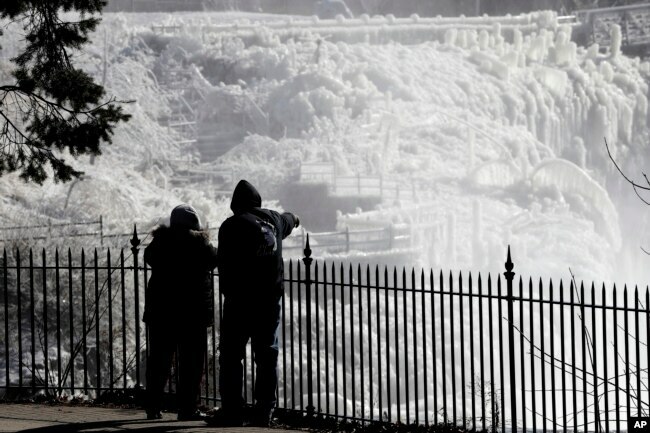 The National Weather Service said Wednesday some 25 million people will face temperatures that cause near-instant frostbite in New England (the northeastern United States) and the Midwest — states such as Wisconsin, Minnesota, Illinois and Michigan. In Chicago, Amtrak canceled train service, and even federal mail delivery was suspended in many areas to protect the mail carriers, whose motto declares they deliver mail in almost any weather condition. In some cities, bus service has been suspended because the cold can cause mechanical difficulties. 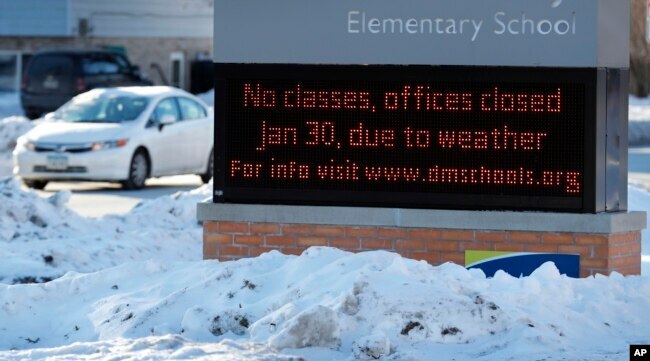 A car passes an elementary school closed due to cold weather in Des Moines, Iowa, Jan. 30, 2019. The governors of Illinois, Michigan and Wisconsin have declared states of emergency. With the wind chill, it was minus 32 degrees Celsius (minus 26 degrees Fahrenheit) in North Dakota on Tuesday and minus 52 degrees in parts of Minnesota. The high temperature in Minneapolis on Wednesday is forecast to be minus 25 degrees Celsius (minus 13 degrees Fahrenheit). In the city of Chicago, renowned for its tough winters, the temperature Thursday is expected to dip near the record low of negative 32.8 degrees Celsius. Mayor Rahm Emanuel is calling the weather "life-threatening." Transit buses with nurses on board will be dispatched across the city to serve as emergency warming shelters for the homeless. Churches throughout Detroit are also keeping their doors open for anyone who has no home and needs a place to keep warm. At least four weather-related deaths have been reported. Ice is seen on the side of the Great Falls National Historic Park as a couple takes in the sights during a frigid winter day in Paterson, N.J., Jan. 30, 2019. The cold air will stretch from the Midwest to the East Coast and as far south as parts of Florida. Meteorologists blame the weather on a breakup of the polar vortex — cold temperatures above the North Pole are being pushed south across North America because of a blast of desert heat from North Africa. Reacting to the weather, President Donald Trump tweeted Tuesday "What the hell is going on with Global Waming? (sic) Please come back fast. We need you!" It is unclear if the president was joking. The National Oceanic and Atmospheric Administration, which is devoted to climate science and information, tweeted, "Winter storms do not prove global warming is not happening." The agency said severe snowstorms may be more likely in a warmer climate because of the increased moisture in the atmosphere. NOAA denies any connection between the president's comment and its social media posting. "We routinely put this story out at these times," the agency said in a statement. "Our scientists weren't responding to a tweet."